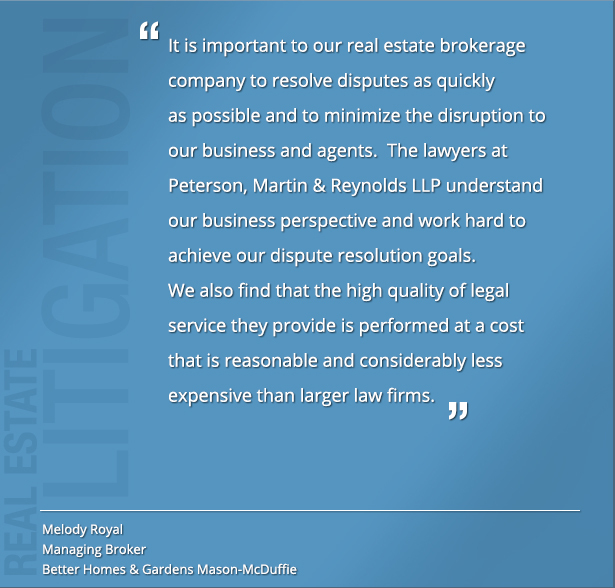 Peterson, Martin & Reynolds LLP was founded with real estate litigation as a core component of our practice. Our attorneys have extensive experience and success representing parties in disputes arising out of purchase and sale transactions, construction and renovation, real property ownership and damage, land use, commercial leasing, insurance coverage, real estate development and property management. Since starting our practice in 1997, we have continued to expand and apply our knowledge and understanding of the law and legislation affecting real estate matters. We have also developed relationships with experts and other professionals in the field that provide valuable insight into the practical application of real estate rules.